Napoleon III was very partial to the unique taste of Gottlieber wafer rolls. 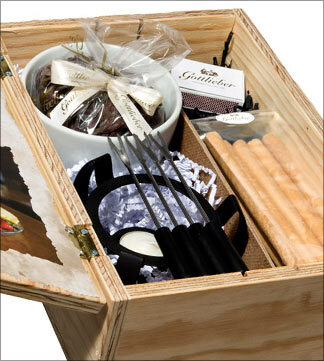 And Gottlieber have now created the ultimate taste experience – unfilled wafer rolls with a delicious chocolate fondue. The chocolate with 52% cocoa content is made exclusively from carefully selected premium cocoas sourced in Ecuador, Colombia and Ghana. Treat your taste buds to a seductive array of subtle flavours such as vanilla, honey, caramel, raisins, apricots, cinnamon, liquorice and roast hazelnuts. The combination of crispy Gottlieber wafer rolls, fresh fruits and finest chocolate guarantees a unique and exclusive taste experience. 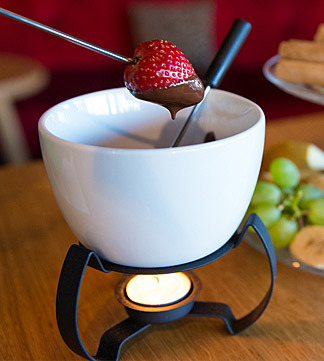 How to prepare your very own chocolate fondue: Slowly heat your chocolate in a small pan. Once melted, pour carefully into the bowl and keep warm over the provided Rechaud (portable stove). 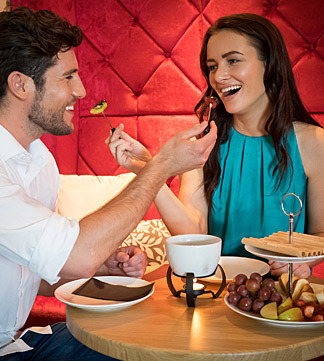 If you notice any burning, blow out the candle and let sit for a short period.Gently dip your Gottlieber Hueppen and fresh fruits into the now liquid chocolate and continuously stir.